Lorena Lopez-Gonzalez, Ph.D., Gary T. Pickens, Ph.D., Raynard Washington, Ph.D., and Audrey J. Weiss, Ph.D. The difference in hospital utilization among patients covered by Medicaid and those who are uninsured may reflect differences in the characteristics of these populations and their level of access to health care. Medicaid is intended for individuals with low income, who are more likely than patients who are uninsured or privately insured to be pregnant or to have chronic health conditions or a disability.4 Individuals who are uninsured are less likely than those enrolled in Medicaid to be aware that they have a chronic condition and are therefore less prone to control the condition through medical care.5 Hospital utilization among the Medicaid and uninsured populations will continue to be of interest to policy analysts and other stakeholders as a result of the expansion of the Medicaid program to cover more of the nation's uninsured population under the Affordable Care Act. This HCUP Statistical Brief describes 2012 hospital stays with a primary expected payer of Medicaid and stays that were uninsured. This information represents an update to 2008 data presented in HCUP Statistical Brief #104.6 Hospital stays with an expected primary payer of private insurance are used as a comparison point for Medicaid and uninsured stays. Hospital and patient characteristics for hospital inpatient stays in 2012 are presented by expected primary payer. The most common diagnoses and the most common operating room (OR) procedures by expected primary payer also are provided. All differences in mean estimates and proportions between expected payers noted in the text are statistically significant at the .0001 level or better. Of the 36.5 million total hospital inpatient stays in 2012, 20.9 percent had an expected primary payer of Medicaid and 5.6 percent were uninsured; 30.6 percent were covered by private insurance. Medicaid hospitalizations had a longer average length of stay but lower mean hospital cost per stay than did privately insured hospitalizations. Patients covered by Medicaid were on average younger and more likely to live in low-income areas than were patients with private insurance. Patients who were uninsured were more likely to be male and to live in low-income communities than were patients with private insurance. For all three expected primary payers, more than half of all hospital stays occurred in large, urban teaching, and private not-for-profit hospitals. For nonmaternal and nonneonatal hospital stays among Medicaid and uninsured patients, mood disorders and other behavioral disorders were the most common diagnoses. Six of the top 10 diagnoses for Medicaid hospitalizations were ambulatory care sensitive conditions. Cholecystectomy (gall bladder removal) was the most common operating room procedure for Medicaid and uninsured stays. Table 1 presents general characteristics of hospital inpatient stays by expected primary payer—Medicaid, uninsured, and private insurance—in 2012. In 2012, 20.9 percent of hospitalizations were billed to Medicaid and 5.6 percent were uninsured, compared with 30.6 percent billed to private insurance. In 2012, there were 36.5 million hospital stays with associated hospital costs of $377.5 billion. Approximately 9.6 million total hospital stays either were billed to Medicaid (7.6 million stays, 20.9 percent of all stays) or were uninsured (2.0 million stays, 5.6 percent of all stays). By comparison, private insurance was the expected primary payer for 11.2 million hospital stays (30.6 percent of all stays). In 2012, a total of $79.8 billion in aggregate hospital costs were for stays covered by Medicaid ($61.7 billion, 16.3 percent of all aggregate costs) or were for uninsured stays ($18.1 billion, 4.8 percent of all aggregate costs). In contrast, private insurance covered $107.8 billion in aggregate hospital costs (28.6 percent of all aggregate costs). In 2012, the percentage of aggregate costs was lower than the percentage of hospital stays across all three expected payers. For Medicaid hospitalizations, mean length of stay was longer but mean cost per stay was lower compared with privately insured hospitalizations. The average length of a hospital stay was longer for stays billed to Medicaid (4.3 days) and for uninsured stays (4.0 days) than for stays billed to private insurance (3.8 days). However, average cost per stay was lower for Medicaid stays ($8,100) than for privately insured stays ($9,700). Table 2 presents hospital ownership, location/teaching status, and bed size characteristics for Medicaid, uninsured, and privately insured hospital stays in 2012.
a Bed size categories are based on hospital beds and are specific to the hospital's location and teaching status. The definitions of small, medium, and large vary by region. Refer to the Definitions section at the end of this Statistical Brief for bed size category details. More than half of all Medicaid and uninsured hospital stays occurred in large, urban teaching, and private not-for-profit hospitals. Approximately two-thirds of Medicaid and uninsured hospital stays occurred at private, not-for-profit hospitals (69.3 and 63.7 percent, respectively); the proportion of privately insured stays was somewhat higher (78.3 percent). Just over half of stays across all three payers were at urban teaching hospitals (range, 52.0-55.5 percent), and just over one-third of stays were at urban nonteaching hospitals (range, 33.5-37.2 percent). Sixty percent of hospital stays across the three payer types occurred at large hospitals, and just over one-fourth of stays occurred at medium-sized hospitals. Table 3 presents the 2012 demographic characteristics of patients who were hospitalized with an expected primary payer of Medicaid, patients who were uninsured, and patients with an expected primary payer of private insurance. a Percentages may not sum to 100 percent because of a small number of records with missing data. b A total of 2.2 percent of Medicaid hospital stays were for patients aged 65 years and older. This may represent patients who have Medicaid and Medicare dual coverage for whom Medicaid is the first-listed expected primary payer on the hospital discharge record. Patients who were hospitalized with Medicaid as the expected primary payer were younger and more likely to live in low-income communities and large central metropolitan areas compared with patients who had private insurance as the expected primary payer. In 2012, compared with patients with stays billed to private insurance, patients with hospital stays billed to Medicaid were on average younger (25.3 vs. 36.6 years) and more likely to live in the poorest communities (41.3 vs. 20.1 percent) and to live in large central metropolitan areas (36.5 vs. 28.1 percent). Patients with uninsured hospitalizations were more likely to be male and to live in low-income communities compared with patients with privately insured hospitalizations. In 2012, compared with patients with privately insured hospitalizations, patients with uninsured hospitalizations were more likely to be male (53.9 vs. 40.3 percent) and to reside in low-income communities (37.4 percent vs. 20.1 percent). 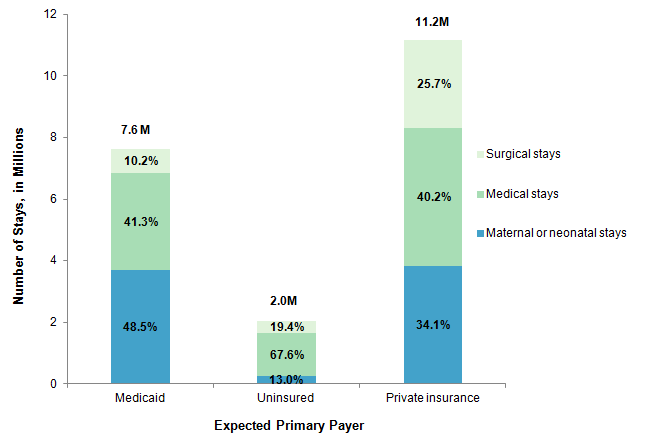 Figure 1 presents 2012 hospital inpatient stays with an expected primary payer of Medicaid, uninsured, and private insurance by type of stay. For each expected primary payer, hospitalizations were segmented into three types of stay: (1) maternal and neonatal, (2) medical, and (3) surgical. Maternal and neonatal stays constituted a larger share of Medicaid stays but a smaller share of uninsured stays compared with the maternal and neonatal share of privately insured stays. Maternal and neonatal stays accounted for nearly half (48.5 percent) of all Medicaid hospitalizations compared with just over one-third (34.1 percent) of all privately insured hospitalizations. Uninsured hospital stays had the lowest proportion of maternal and neonatal stays at 13.0 percent. Medical stays accounted for a majority of uninsured hospital stays (67.6 percent) but only 40.2 percent of privately insured stays and 41.3 percent of stays covered by Medicaid. Table 4 provides the top 10 principal diagnoses for medical and surgical stays (i.e., stays that were not maternal or neonatal) in 2012 among patients covered by Medicaid and those who were uninsured compared with patients covered by private insurance. a Clinical Classifications Software (CCS), which groups diagnoses into clinical categories, was used in this analysis. b Excludes maternal and neonatal. Source: Agency for Healthcare Research and Quality (AHRQ), Center for Delivery, Organization, and Markets, Healthcare Cost and Utilization Project (HCUP), National Inpatient Sample (NIS), 2012. The most common diagnosis for Medicaid and uninsured stays was mood disorders. Mood disorders constituted the most common diagnosis for stays among patients covered by Medicaid (6.1 percent of stays) and those who were uninsured (5.2 percent of stays). Mood disorders ranked second among diagnoses for privately insured stays (3.6 percent of stays). Other behavioral health diagnoses were observed among the 10 most frequent diagnoses for Medicaid and uninsured stays but not for privately insured stays. Specifically, schizophrenia was the third most common diagnosis for Medicaid stays and alcohol-related disorders was the fourth most common diagnosis for uninsured stays. Six out of the top 10 diagnoses for Medicaid hospitalizations were for conditions for which good outpatient or preventive care can potentially prevent the need for hospitalization. Pneumonia, asthma, diabetes mellitus with complications, epilepsy, acute bronchitis, and chronic obstructive pulmonary disease (COPD) ranked among the top 10 diagnoses for Medicaid hospitalizations. Together, these diagnoses are considered ambulatory care sensitive conditions (ACSCs)—conditions for which good outpatient care can potentially prevent or reduce disease progression and the need for hospitalization. These six ACSCs accounted for 15.6 percent of all nonmaternal and nonneonatal Medicaid hospital stays. In contrast, among uninsured stays only pneumonia (ranked tenth) and diabetes mellitus with complications (ranked third) were among the top 10 diagnoses, together accounting for 6.0 percent of hospitalizations. Among privately insured hospitalizations, pneumonia was the only ACSC among the top 10 diagnoses (ranked fourth), accounting for 2.6 percent of hospitalizations. The most common diagnoses for uninsured hospital stays covered a wide range of clinical conditions. Among uninsured hospital stays, the top 10 diagnoses were from a wide range of clinical conditions: mental illness, skin disease, endocrine disorders, infectious disease, digestive disease, circulatory disease, and respiratory disease. Four of the top 10 diagnoses were unique to uninsured patients and were not among the most common diagnoses for privately insured or Medicaid patients. Specifically, alcohol-related disorders, biliary tract disease, nonspecific chest pain, and pancreatic disorders were common only for uninsured hospital stays. Five conditions were common only for privately insured stays: osteoarthritis; spondylosis, intervertebral disc disorders; cardiac dysrhythmias; complications of surgical procedures or medical care; and complication of device, implant or graft. Medicaid hospitalizations had the following five uniquely common conditions: schizophrenia, asthma, epilepsy, acute bronchitis, and COPD. Table 5 shows the top 10 operating room (OR) procedures performed during hospital surgical inpatient stays—excluding maternal and neonatal stays—in 2012 for patients with an expected primary payer of Medicaid and those who were uninsured compared with those with an expected primary payer of private insurance. a Clinical Classifications Software (CCS), which groups procedures into clinical categories, was used in this analysis. Cholecystectomy was the most common operating room procedure for Medicaid and uninsured stays. Nine of the 10 most common OR procedures for Medicaid and privately insured hospital stays involved the digestive system, female genital organs, nervous system, musculoskeletal system, or cardiovascular system. Medicaid and privately insured hospitalizations shared 9 of the 10 most common OR procedures. These procedures involved the digestive system (cholecystectomy and appendectomy), female genital organs (hysterectomy and oophorectomy), nervous system (laminectomy), musculoskeletal system (knee arthroplasty, spinal fusion, partial excision bone), or cardiovascular system (PTCA). For Medicaid stays, excision, lysis peritoneal adhesions (digestive system) was among the 10 most common OR procedures, and for privately insured stays, hip replacement (musculoskeletal system) was among the 10 most common OR procedures. The most common OR procedures for uninsured hospital stays involved the digestive system, cardiovascular system, musculoskeletal system, or female genital organs. The most common OR procedures for uninsured hospital stays involved the digestive system (appendectomy; cholecystectomy; colorectal resection; and excision, lysis peritoneal adhesions), cardiovascular system (PTCA), musculoskeletal system (treatment, fracture or dislocation of lower extremity), or the female genital organs (hysterectomy and oophorectomy). Five of the top 10 OR procedures for uninsured patients were not common among privately insured patients: treatment, fracture or dislocation of lower extremity; intraoperative cholangiogram; excision, lysis peritoneal adhesions; debridement of wound, infection or burn; and colorectal resection. The estimates in this Statistical Brief are based upon data from the Healthcare Cost and Utilization Project (HCUP) 2012 National Inpatient Sample (NIS). Estimates of the volume for selected operating room (OR) procedures were generated from HCUPnet, a free, online query system that provides users with immediate access to the largest set of publicly available, all-payer national, regional, and State-level hospital care databases from HCUP.7 HCUPnet provides the ability to retrieve health statistics and information on hospital inpatient and emergency department utilization. Many hypothesis tests were conducted for this Statistical Brief. Thus, to decrease the number of false-positive results, we reduced the significance level to .0001 for individual tests. ICD-9-CM is the International Classification of Diseases, Ninth Revision, Clinical Modification, which assigns numeric codes to diagnoses and procedures. There are approximately 14,000 ICD-9-CM diagnosis codes and approximately 4,000 ICD-9-CM procedure codes. CCS categorizes ICD-9-CM diagnosis codes into a manageable number of clinically meaningful categories.8 This clinical grouper makes it easier to quickly understand patterns of diagnoses. CCS categories identified as Other typically are not reported; these categories include miscellaneous, otherwise unclassifiable diagnoses that may be difficult to interpret as a group. MDCs assign ICD-9-CM principal diagnosis codes into one of 25 general diagnosis categories. For this report, maternal hospital stays were identified using MDC 14 (pregnancy, childbirth, and the puerperium) and neonatal hospital stays were identified using MDC 15 (newborns and other neonates with conditions originating during the perinatal period). For this report, major operating room (OR) procedures were defined using procedure classes, which categorize each ICD-9-CM procedure code as either major therapeutic, major diagnostic, minor therapeutic, or minor diagnostic.9 Major OR procedures are considered to be valid OR procedures based on DRGs. This classification scheme relies upon physician panels that classify ICD-9-CM procedure codes according to whether the procedure would be performed in a hospital OR in most hospitals. Major OR procedures were identified using all procedure fields (first-listed and secondary) that were available on the discharge record. For the purposes of this Statistical Brief, the number of OR procedures is reported to the nearest hundred. The National (Nationwide) Inpatient Sample (NIS) is based on data from community hospitals, which are defined as short-term, non-Federal, general, and other hospitals, excluding hospital units of other institutions (e.g., prisons). The NIS includes obstetrics and gynecology, otolaryngology, orthopedic, cancer, pediatric, public, and academic medical hospitals. Excluded are long-term care facilities such as rehabilitation, psychiatric, and alcoholism and chemical dependency hospitals. Beginning in 2012, long-term acute care hospitals are also excluded. However, if a patient received long-term care, rehabilitation, or treatment for psychiatric or chemical dependency conditions in a community hospital, the discharge record for that stay will be included in NIS. The classification of whether a hospital is in a metropolitan area (urban) or nonmetropolitan area (rural) is defined from the American Hospital Association (AHA) Annual Survey, using the 1993 definition from the U.S. Office of Management and Budget. Bed size categories are based on hospital beds and are specific to the hospital's location and teaching status. The definitions of small, medium, and large hospital bed size vary by region. Teaching indicates whether the hospital in which the stay occurred is a teaching or a nonteaching hospital. A hospital is considered to be a teaching hospital if it has an approved residency program, is a member of the Council of Teaching Hospitals, or has 25 or more interns and residents per 100 hospital beds. Hospital bed sizes are presented in Table 6. When more than one payer is listed for a hospital discharge, the first-listed payer is used. Patients covered by both Medicare and Medicaid with Medicare listed as the primary payer were excluded from this analysis. Lopez-Gonzalez L (Truven Health Analytics), Pickens GT (Truven Health Analytics), Washington R (AHRQ), Weiss AJ (Truven Health Analytics). Characteristics of Medicaid and Uninsured Hospitalizations, 2012. HCUP Statistical Brief #182. October 2014. Agency for Healthcare Research and Quality, Rockville, MD. http://www.hcup-us.ahrq.gov/reports/statbriefs/sb182-Medicaid-Uninsured-Hospitalizations-2012.pdf. 1 Centers for Medicare & Medicaid Services. Eligibility. https://www.medicaid.gov/medicaid/program-information/medicaid-and-chip-eligibility-levels/index.html. Accessed November 8, 2017. 2 The Kaiser Family Foundation. State Health Facts. http://www.statehealthfacts.org/. Accessed May 1, 2014. 3 Pfuntner A, Wier LM, Elixhauser A. Overview of Hospital Stays in the United States, 2011. HCUP Statistical Brief #166. November 2013. Agency for Healthcare Research and Quality, Rockville, MD. http://www.hcup-us.ahrq.gov/reports/statbriefs/sb166.pdf. Accessed August 14, 2014. 4 Holahan J, Kenney G, Pelletier J. The Health Status of New Medicaid Enrollees Under Health Reform: Timely Analysis of Immediate Health Policy Issues. The Robert Wood Johnson Foundation and The Urban Institute; August 2010. http://www.rwjf.org/content/dam/farm/reports/issue_briefs/2010/rwjf65185. Accessed July 11, 2014. 5 Decker SL, Kostova D, Kenney GM, Long SK. Health status, risk factors, and medical conditions among persons enrolled in Medicaid vs uninsured low-income adults potentially eligible for Medicaid under the Affordable Care Act. JAMA. 2013;309(24):2579-86. 6 Stranges E, Ryan K, Elixhauser A. Medicaid Hospitalizations, 2008. HCUP Statistical Brief #104. January 2011. Agency for Healthcare Research and Quality, Rockville, MD. http://www.hcup-us.ahrq.gov/reports/statbriefs/sb104.pdf. Accessed September 30, 2014. 7 Agency for Healthcare Research and Quality. HCUPnet Web site. http://hcupnet.ahrq.gov/. Accessed July 15, 2014. 8 Agency for Healthcare Research and Quality. HCUP Clinical Classifications Software (CCS). Healthcare Cost and Utilization Project (HCUP). Rockville, MD: Agency for Healthcare Research and Quality. Updated July 2014. http://www.hcup-us.ahrq.gov/toolssoftware/ccs/ccs.jsp. Accessed September 11, 2014. 9 HCUP Procedure Classes. Healthcare Cost and Utilization Project (HCUP). Rockville, MD: Agency for Healthcare Research and Quality. Updated September 2013. http://www.hcup-us.ahrq.gov/toolssoftware/procedure/procedure.jsp. Accessed May 12, 2014. 10 Agency for Healthcare Research and Quality. HCUP Cost-to-Charge Ratio (CCR) Files. Healthcare Cost and Utilization Project (HCUP). 2001-2011. Rockville, MD: Agency for Healthcare Research and Quality. Updated August 2014. http://www.hcup-us.ahrq.gov/db/state/costtocharge.jsp. Accessed September 11, 2014. 11 For additional information about the NHEA, see Centers for Medicare & Medicaid Services (CMS). National Health Expenditure Data. CMS Web site May 2014. http://www.cms.gov/Research-Statistics-Data-and-Systems/Statistics-Trends-and-Reports/NationalHealthExpendData/index.html?redirect=/NationalHealthExpendData/. Accessed October 9, 2014. 12 American Hospital Association. Trend Watch Chartbook, 2014. Table 4.2. Distribution of Inpatient vs. Outpatient Revenues, 1992â€“2012. http://www.aha.org/research/reports/tw/chartbook/2014/table4-2.pdf. Accessed October 9, 2014. Internet Citation: Statistical Brief #182. Healthcare Cost and Utilization Project (HCUP). May 2016. Agency for Healthcare Research and Quality, Rockville, MD. www.hcup-us.ahrq.gov/reports/statbriefs/sb182-Medicaid-Uninsured-Hospitalizations-2012.jsp.